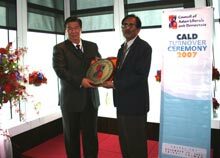 Liberal International (LI) and the Council of Asian Liberals and Democrats (CALD), with the support of the Friedrich Naumann Foundation (FNF) and the Taiwan Fund for Democracy, organized the conference “Strengthening Networks and Combating Human Trafficking” in Taipei, Taiwan from December 7-10 2007. Hosted by the Democratic Progressive Party of Taiwan (DPP), the conference was designed to create awareness of human trafficking in Asia, to analyze its dynamics and to work out policy responses. It also looked at the role of liberal parties and parliamentarians in the promotion and protection of human rights. FNF Resident Representative Siegfried Herzog meets Taiwan President Chen Shui-bian. Former CALD Chairman and Taiwan President Chen Shui-bian contextualized the conference by recounting how a group of human rights activists founded the DPP 20 years ago. He also described its struggle during martial law and reiterated its commitment to the cause of democracy and human rights worldwide. Lord John Alderdice, LI president, underlined the importance of human rights promotion. He pointed out that it has become the bedrock of the international system as humanity has seen the need to impose restraints on its capacity for destructive behaviour. He also voiced his concerns over the current trend to sacrifice human rights in the war on terror. This indifference to human rights was particularly touched upon by former Philippine Senator and CALD Chairman Franklin Drilon. He criticized his own country’s disregard for human rights citing the continuance of enforced disappearances and extrajudicial killings of activists. Delegates share a light moment with Lord Alderdice. The promotion of human rights was not the only issue dealt with at the conference. Delegates also tackled the difficulty of protecting individual rights especially in the face of human trafficking. Calling it a modern form of slave trade, participants discussed the need to avoid criminalizing its victims. They talked about devising ways to help victims escape illegality without facing instant deportation. A possible positive step in the direction of human rights was the recent signing of the Association of Southeast Asian Nations (ASEAN) Charter. Many at the conference viewed its incorporation of a human rights body as a significant step. On the other hand, others viewed this with cynicism. They cited that ASEAN still upheld the principle of mutual non-interference and left the foreign ministers to elaborate on the human rights body’s terms of reference. In the light of all this, the delegates agreed that parliamentarians must play a bigger role in speaking up against injustice. They can do so more forcefully than governments and are more able to facilitate dialogue with other countries. Former Senator Drilon turns over the CALD leadership to SDP Chairman Gandhi Ambalam. The conference ended with LI’s annual Isaiah Berlin Lecture. Lord Alderdice devoted this to the issues of conflict resolution and reconciliation. He stressed that more than economic or law and order problems, it is the lack of respect that incites conflict. Citing his experiences in Northern Ireland, he said that rebuilding trust and respect will do more to ensure peace than a military solution. The LI-CALD forum also marked the turnover of the CALD leadership from the Liberal Party of the Philippines (LP) to the Singapore Democratic Party (SDP). Dr. J.R. Nereus Acosta of the LP remains CALD secretary-general while the SDP continues to face numerous legal battles.